Designed and constructed to provide the balance and support necessary to easily lift your pets body weight without back strain.Washable. 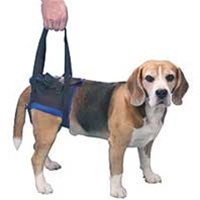 Recommended by veterinary surgeons as the most effective walking aid on the market, Walkabout Harnesses are commonly used on animals with arthritis, hip displasia, spinal trauma and general fatigue. Plus they help prevent back injury to pet owners from lifting pets improperly. Our front, back and combo harnesses will keep your pet happy and mobile despite his or her injuries or age-related problems. The Walkabout Harness is designed to fit both male and female pets. Please discuss the use of this product with your veterinarian. If you are unsure of how to use the harness properly, their assistance is strongly recommended for the safety and comfort of your pet. Be sure your pet can urinate with ease, if not, please verify your measurements and consult your veterinarian.